The Juno spacecraft captured this image when the spacecraft was only 18,906 kilometers from the tops of Jupiter’s clouds — that’s roughly as far as the distance between New York City and Perth, Australia. 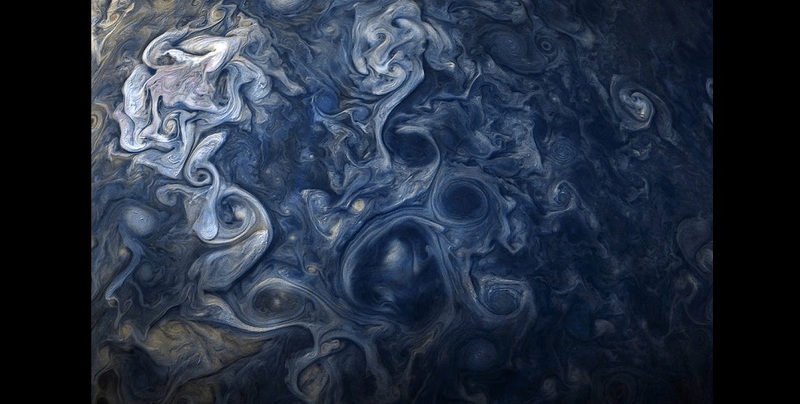 The color-enhanced image, which captures a cloud system in Jupiter’s northern hemisphere, was taken on Oct. 24, 2017 when Juno was at a latitude of 57.57 degrees (nearly three-fifths of the way from Jupiter’s equator to its north pole) and performing its ninth close flyby of the gas giant planet. The spatial scale in this image is 2.5 kilometers/pixel. The probe's journey began just over five years ago, on 5 August 2011, and it arrived at its destination, Jupiter's orbit, on 4 July this year (in Italy, it was at dawn on the following day) after travelling a distance of approximately three billion kilometers. JUNO's goal is to analyse the Jupiter’s characteristics as representative of the giant planets. The Solar System’s ‘heavyweight’ can, in fact, offer fundamentally important data not only for gaining deeper knowledge of the origin of the System itself, but also for analyzing those of the planetary systems that are gradually discovered around other stars, with particular reference to those exoplanets that have a similar mass to that of Jupiter. JUNO's heart is the Italian JIRAM (Jovian InfraRed Auroral Mapper), financed by ASI, built by Leonardo-Finmeccanica and operated under the scientific responsibility of INAF's Institute of Astrophysics and Planetology (IAPS). JUNO's other Italian component is KaT (Ka-Band Translator), a radio science instrument designed by the 'La Sapienza' University of Rome, built by Thales Alenia Space Italia (A Thales/Leonardo-Finmeccanica company) again with ASI's support.